Reid's first solo exhibition, Ma: A History of Us, at Siddhartha Art Gallery occurred at the end of her Fulbright grant in Nepal. The exhibition, what she considered a love letter to Nepal, her collaborators, and her time there, focused on her varied Fulbright projects. Audience were asked to wash their feet and take of their shoes before entering the exhibition. Ground floor of the exhibition, featuring sand installation and raised platform for performances. Life size portraits of all the ensemble members. Self portraits and quotes about the "History of my Body" made by ensemble members during the creation of AAMAA. Book of process photos taken by Sonam Choekyi Lama during the rehearsals and live performances. Stairway to upper floor with video projections of Ma (part 1-4). 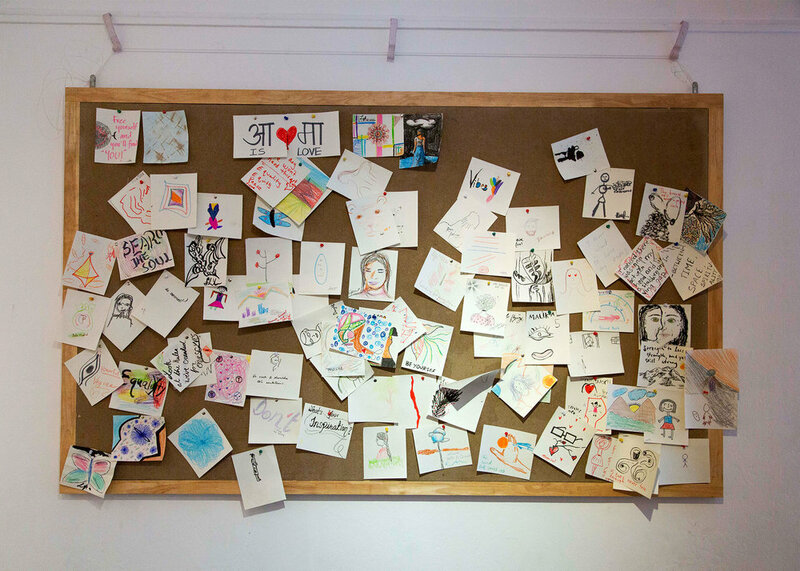 Self-portraits made by visitors to the gallery that accumulated throughout the exhibition. Final score for performance drawing. Exhibition title + Reid's great-grandmother's hair on display as the inspiration behind the project. Self portraits by ensemble and exhibition visitors. Stage for performances during exhibition opening. Visitor watches 4-feed video installation of Ma (part 1-4). Audience watching live performances both inside and outside the gallery space. Exhibition visitors were asked to wash their feet and take off their shoes before entering the gallery. Once inside, they walked through sand downstairs (an ode to the way that Nepali women washed their hair in the Kathmandu valley thousands of years ago, with light sand they dug from the earth) and upstairs visitors walked through leaves collected from the locations where the film Ma (part 1-4) was filmed. 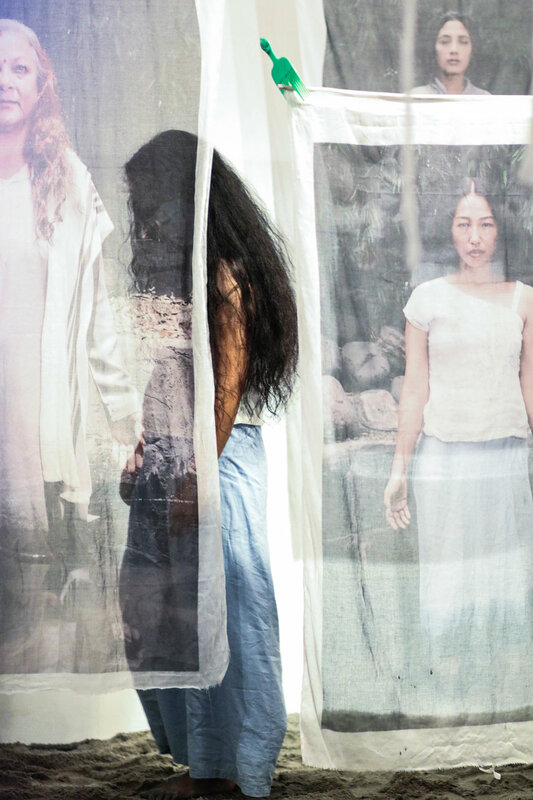 Downstairs the exhibition included life-size portraits of the ten female ensemble members, printed on fabric. Keepa Maskey, created a three-part textile installation (Blooming Belly, Petticoat, and Womb) as well. Visitors could look through handmade books compiled with drawn scores for the performances and Reid's journals and sketchbooks from throughout the creation process. One book featured photographs taken by Sonam Choekyi Lama during the rehearsal and performance processes. One wall of the downstairs space featured self-portraits drawn by ensemble members and quotes from their writings on the History of my Body. Visitors were instructed with scores as to how best to interact with the space: inviting them to draw their own self portraits, dance on the raised platform in the center of the stage, participate in workshops given in the gallery space, or come to see performances every evening. Upstairs, a video installation of Ma (part 1-4), played on four projection feeds, accompanied by a sound scape created by Irina Giri and performed by musicians Shreeti Pradhan, Kishan Shrestha, Mannu Shahi, and Pranav Manandhar. The exhibition focused on sharing the process of creating a work of art with the public, as well as exhibiting finished pieces. Post-modern dance, creative collectives and scoring were all defined and presented to people walking through, engaging the audiences five senses and giving them freedom to interact with this world and space created by women. During the exhibition, live performances occurred every evening. Duets and solos from previous performances of AAMAA were shown this a new space, a gallery setting. Audience had the opportunity to be close to the performers. Performers often stood, palms open, in front of audience members and touch was encouraged. The performances were accompanied by live musicians: Shreeti Pradhan, Mannu Shahi, Kishan Shrestha, Irina Giri, and Pranav Manandhar. The video above was filmed and edited by Anjon Limbu.